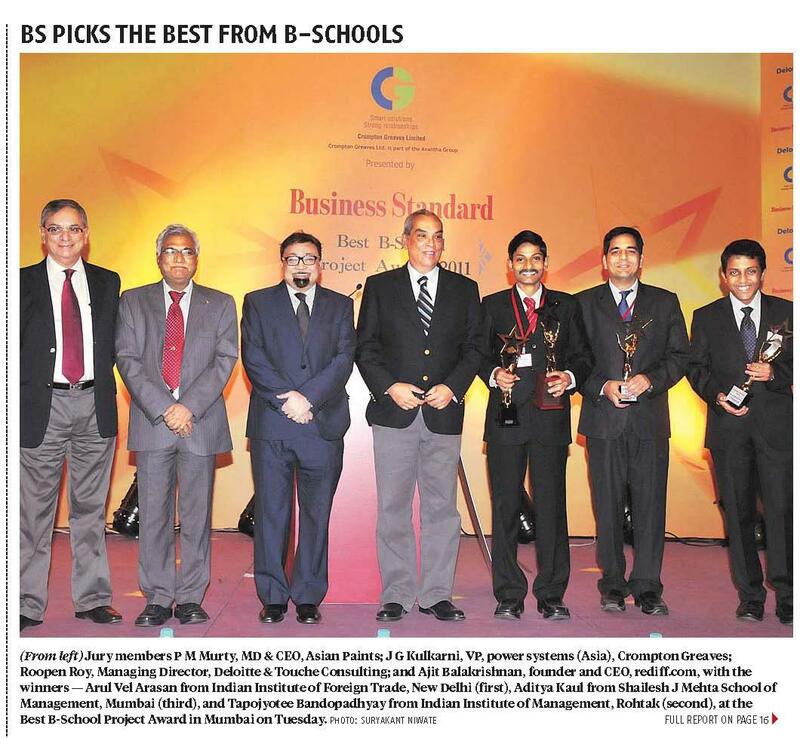 Aditya Kaul, a second year student at Shailesh J Mehta School of Management, Mumbai, claimed the third position at the Business Standard Best B School Project Award 2012. He proposed to solve the complexities of Asian Paints by using technology like SAP CRM. 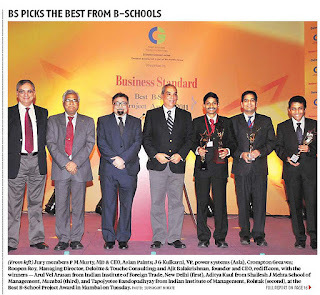 Arul Vel Arasan, a management student from the Indian Institute of Foreign Trade (IIFT), bagged the first prize for his idea to sell a Rs 2 per day health insurance scheme for rural India and Tapojyotee Bandopadhyay of the Indian Institute of Management, Rohtak, bagged the second position. The jury, chaired by Ajit Balakrishnan, founder-CEO, Rediff.com, also comprised P M Murty, MD and CEO, Asian Paints; Roopen Roy, MD, Deloitte & Touche Consulting India; Rama Bijapurkar, marketing consultant; and J G Kulkarni, VP (power systems-Asia), Crompton Greaves. Five participants who made the final cut from 135 entries from the country’s top business schools were earlier short listed by the jury, based on the criteria of innovation, rigor, thought, clarity and how implementable their project ideas were. Deloitte had done the initial short listing of 15 projects. Aditya Kaul commented on his choice of project saying that a multi-modal interaction was not available in the existing CRM process of Asian Paints. Also, a central management facility that would capture all transactions was missing. “This prompted me to go for a SAP-based CRM process. Here, the SAP master data would be used by all processes.” The presentation emphasized incentivising customers for getting more data for CRM, customer account and ensuring that senior management implements it. The complete presentation can be found at the following link. In this world of ever growing technology, we can easily watch the latest movies or tv shows by streaming on different websites. People those who loves to download new apps and loves to play new games, Aptoide APK, is a bliss to them. Here you will get all the new apps and games and install them is very easy too. Very informative post! There is a lot of information here top 10 cbse schools in delhithat can help any business get started with a successful social networking campaign.